Left- right: Geraint Wilson-Price, Director of Teaching, Cymraeg Gwent presented the Award to: Nia Meacher, Deputy Director HR; Tracy Hibbert, Director of HR and Mari Ellis-Roberts, HR Officer, Bangor University.Bangor University has won a national award for the best use of Welsh in Human Resources. 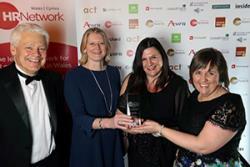 The Award, sponsored by Cymraeg Gwaith, was presented at the Wales Cymru HR Awards at a glittering black tie event, organised by the Wales HR Network. Bangor University’s submission demonstrated the Human Resources Departments’ constant commitment to providing a comprehensive bilingual service to both staff and to those who interact with the team from outside the University. This commitment to providing a bilingual workplace highlights the emphasis that Bangor University places on being a fully bilingual University, both for its students and its employees. Bangor University leads the way in ensuring that staff can access all University services in Welsh, in ensuring the provision of Welsh language tuition to staff free of charge and during working hours. The University encourages the use Welsh at work and encourages staff to develop their Welsh language skills. In addition to being the leading provider of higher education through the medium of Welsh, in terms of volume, breadth of courses, Bangor University is also the sector's standard bearer for Welsh Language services and support. The service provided by the University’s HR Department reflect both the linguistic nature of the region and also best practice in the public sector in Wales. It is an example of a bilingual HR service which also addresses some of the key initiatives of the Welsh Government to sustain and develop the Welsh language. The University also has a high proportion of Welsh speakers or staff learning Welsh. Currently 45% of its staff speak Welsh and 25% speak a little Welsh. In terms of managerial and support staff 53% of staff speak Welsh and 60% of clerical staff speak Welsh. A recent University-wide Staff Survey showed very high satisfaction rates with the University’s the bilingual ethos and provision. 89% of staff felt that they had the opportunity to use their Welsh language skills at work, 88% of staff believe that their College/Department operated bilingually, 96% of staff noted that the University provides information about the Welsh Language Policy, 91% believe that staff are given support to implement the Policy and 92% believe that they have support to develop and improve their Welsh language skills.